FLMB001 with Seafoam "Render EP." 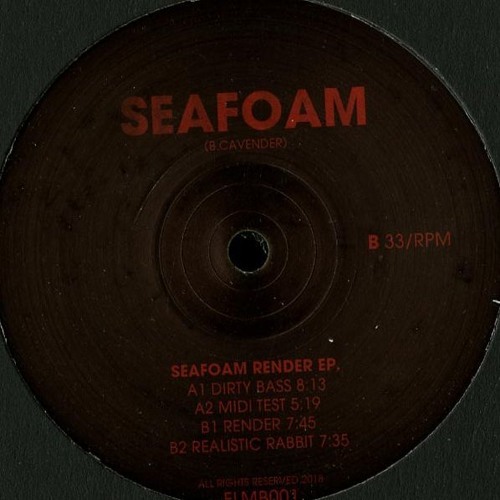 A1 - Dirty Bass A2 - Midi Test B1 - Render Dn B2 - Realistic Rabbit 12" Limited copys Release Date April 2018 All tracks writen and composed by Brian Cavender in Denver, Colorado between 1999 and 2004. Mastered by Mike Grinser at Manmade Masterings Berlin Distribuited by Carpet Distribution Lisbon Pressed by MPO France All Rights Reserved. @thomasmiskin: hey thomas! its going to be distribuited by Carpet & Snares Guys. hug!